Police and wildlife officials said an Ocala neighborhood should be on alert after a venomous cobra escaped from a home Monday night. 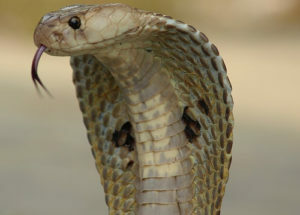 Authorities continue to search for the two-foot-long, monocled cobra that escaped from its owner’s home Monday in Ocala, 70 miles northwest of Orlando. The cobra was reported missing by its owner Brian Purdy around 11:15 pm Monday. Purdy has a venomous reptile permit. He was training another man to handle the cobra when it escaped around 9 pm.